ATTENTIONS:Don't tie the bandage too tight. This product contains adhesive. Please do not buy or use the tape if you have any known allergies to adhesive. -Test on a small inconspicuous patch of skin first to check for any possibly allergic reaction. Wear it for up to 4 hours at first and not overnight. -If you experience any itchiness, rash, redness or warmth around the tape, immediately remove and discontinue use as you may have an allergic reaction. Allergic reactions to the tapes are uncommon but can still occur. -The longer you wear the tape, the greater the chance of an allergic reaction. Monitor for symptoms of an allergic reaction over time. First aid kit essential: A well-stocked bandage can help you respond effectively to common injuries and emergencies. Recommended by most of the professionals. Easy and Safe to use: This tape comes with self-adhering ability so that you don't have to use pins to fix it. Moreover, it doesn't adhere to your hair or skin so you can pull it off easily which is totally different with other traditional tapes. The material used is breathable and safe for your tender skin. 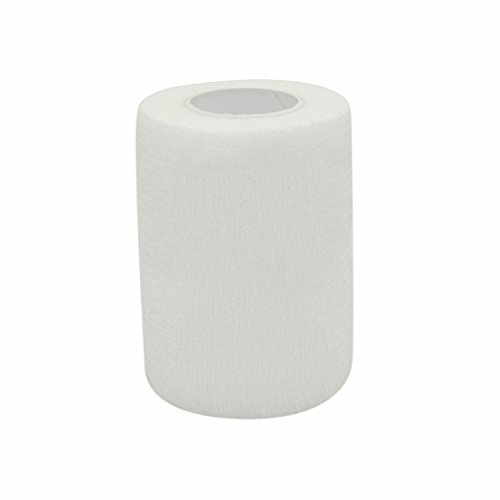 Cost-effective: A single package consists of 3/612/16 bandage rolls! Keep some rolls at workplace, at home, and when traveling, you are never going to run out of those! It is a once in a lifetime buy! Our bandages are high quality product and we guarantee your safety. We offer 100% money back guarantee in case you aren't satisfied of your buy. Strong Self-adhesive:Made of cohesive elastic latex non-woven. Unlike non-adhesive bandages, self-adherent tape does not require clips and pins to stay in place. Easy to use:It can easily be torn by hand. Please note that it will adhere very well to itself but poorly to other surfaces such as skin or hair making it pain-free to pull it off and change bandages. If you have any questions about this product by COMOmed, contact us by completing and submitting the form below. If you are looking for a specif part number, please include it with your message.